In its May 2017 meeting, the FCC made significant changes to the FRS and GMRS services. The new rules took effect at the end of Sept 2017. These rule changes are basically good news for NETs. The following describes the features of these services, primarily under the new regulations. We occasionally reference the older rules, however, because most of the radios we have now were designed to operate under the older rules, so some understanding of those rules can be useful. Here’s what you need to know about the world of FRS/GMRS to be an effective (and legal) FRS/GMRS operator. There is also some buying advice for those who still need to get their radio. FRS (Family Radio Service) is free, and no license is required. It offers a shorter range of operation due to low power and antenna restrictions. GMRS (General Mobile Radio Service) covers a much farther range through higher power and the options of external antennas and repeater operation. However, it requires a license. The license is $65 for 10 years with a simple, online application. There is no exam. The license covers your entire “family.” The word family here is defined broadly. For example, it extends to step-grandchildren and in-laws. Both services have access to all 22 channels, but there are differences in permitted transmission power and FM deviation between services. The channels are illustrated in the table above, where FM refers to a deviation of 5kHz and NFM means a deviation 2.5kHz. What FM deviation means to you is, GMRS radios are going to sound about twice as loud and clear as FRS radios operating at the same power level on channels 15-22 and, consequently, GMRS radios will have a better signal-to-noise ratio. There is also a label in the left-most column of the table above that says 15R-22R. This introduces another difference between the FRS and GMRS services. GMRS can operate on repeater receive frequencies, but FRS cannot. Repeaters use two frequencies, one on which they listen (receive) and one on which they talk (transmit). FRS can only use the frequency on which the repeaters talk. GMRS can use both and can talk to the repeater on the channel on which the repeater is listening. What this means is that a GMRS operator will hear the FRS operator (without benefit of the repeater) and the FRS operator will hear the GMRS operator through the repeater. Of course, if no repeater is available, the GMRS operator can change channel and now the FRS and GMRS operators can communicate on the channel reserved for repeater transmission. Some places, you will see references to “all 30 channels” and this refers to all of the channels in Figure 2, including the 15R-22R repeater “listening channels”. There are other regulation differences between FRS and GMRS. FRS radios must use only permanently attached antennas, although there are table-top FRS “base station” radios that have whip antennas. This limitation intentionally restricts the range of communications, allowing greatest use of the available channels by the community. GMRS does not have this restriction and can have detachable antennas that can be placed on a car top or roof. Channels 2-7 have the advantage that licensed GMRS have always been able to talk with unlicensed FRS operators on those channels. Channel 1 is not used in the recommended NET assignment because it is informally recognized as a national calling channel for emergencies. In the previous paragraph, we point out that most FRS/GMRS hybrid radios can use HIGH power. It is perhaps easier to identify which hybrid radios have power exceeding 2 Watts on HIGH power or are repeater capable and therefore do not fall under the FRS rules. The table in Figure 3 below identifies those radios. It is from Buy Two Way Radios, and they claim to update it with any new information. 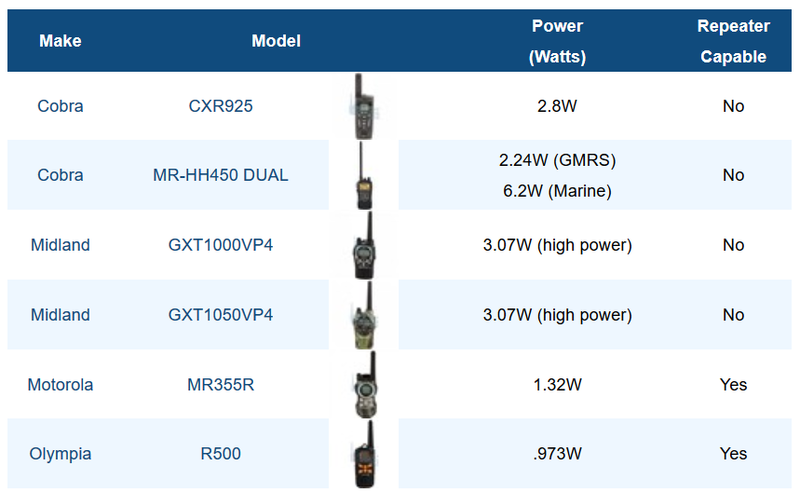 Manufacturers have also sold GMRS-only radios for some time. They will still be classified as GMRS regardless of their transmit power if they have features, such as a detachable antenna or access to repeater receive channels, that are not permitted under FRS rules. Notable among these is the GMRS Baofeng BTECH V-1, which is a (5W/2W/0.5W) handheld that is repeater capable, has a detachable antenna, and is legal on all thirty channels. Since a firmware release in September 2017, its power is automatically limited to 0.5W on channels 8-14. Eventually there will be no more combo FRS/GMRS radios. Any particular radio will be classified for one service or the other. Some provisions for manufacturers are phased in over 18 month to two years. This allows manufacturers to clear inventory, adjust marketing and develop new products. Of course, in an emergency involving the threat of life safety or imminent property damage, you may operate on any channel with any power level. Indeed, this extends to all manner of radios, not just FRS and GMRS. What about the Baofeng UV-5R amateur radio and their ilk? As they say, “It’s complicated.” The UV-5R is not FCC accepted (“type certified”) for transmission on either FRS or GMRS channels. (The reasons for this are not known, but the FCC is usually most concerned with spurious or non-conforming emissions on the prohibited bands.) While it is possible to program the UV-5R to transmit on FRS/GMRS frequencies, it is illegal to transmit on those channels except during an emergency. That little caveat is why many NET AROs have a UV-5R in the radio stash. NET AROs can use the UV-5R as their ham handheld and monitor FRS/GMRS channels at the same time. They typically have a regular dual-service FRS/GMRS handheld for transmitting on the channels. If push came to shove in an emergency, they could use the UV-5R for FRS/GMRS as well as ham. The UV-5R has other nifty emergency radio features, such as their ability to transmit (legally) on BEECN frequencies with the approval of PBEM, the ability to receive Emergency Alert System (EAS) notification from commercial FM stations, NOAA weather station reception, and even the ability to serve as a cross-band repeater. These radios also have some disadvantages, such as more idiosyncratic programming requirements and sensitivity to radio signals outside the amateur radio reception bands. We come back to those issues elsewhere. Before the rule change, a GMRS-only radio gave up the ability to transmit on the FRS-only channels (8-14) but retained the shared FRS/GMRS channels and gains the options of higher power and use of an external antenna. Both features can significantly increase the available range and could be useful for teams needing more geographic coverage. Many, but not all, GMRS radios can also use GMRS repeaters, transmitting on the additional 7 channels (23-30 or 15R-22R in the table above) that are 5MHz above the repeater channels 15-22. Subsequent to the rule change, however, some of the manufactures began updating firmware in their GMRS radios, so that they can transmit on all of the 30 GMRS channels, including the previous FRS-only channels. The only way to know for sure is to do some research or, better still, talk to someone who has tested the make and model in which you are interested. The Midland MXT100 is a mobile GMRS-only radio with 5.0 watts and a magnetic-mount external antenna. It does not contain batteries but uses a cigarette lighter plug for powering off a vehicle 12v system. The radio is quite small and includes a quick release bracket for easy vehicle changes. Here’s a link to an earlier, more detailed NET review. This is a radio that is still limited to the pre-2017 GMRS channels. The BTech/Baofeng GMRS-V1 is a handheld GMRS-only radio. It is also a 5-watt radio. In September 2017, Baofeng introduced a firmware change, and units purchased today will transmit on all 30 GMRS channels. It has the ability to transmit on any GMRS channel including GMRS repeaters. It can receive VHF/UHF ham, public service, NOAA, and FM broadcasts. It has a replaceable antenna. Many battery, antenna, and earbud/mic options are available, and these are interchangeable with certain Baofeng ham radio HTs. The FCC allows for repeaters in the GMRS service. A GMRS repeater can dramatically increase the coverage area. (But note the potential interference issue discussed in .) There are currently no GMRS repeaters in the Portland area although several NET teams in geographically challenging areas are considering them. If anyone is interested in the topic, a good resource is myGMRS. Good operating practices – operating in FRS or GMRS requires the same operating skills as amateur radio. In the field, you’ll need to handle messages, work with radio nets, understand what kinds of things should not be said on the air, and how to pass messages containing words that you do not recognize and cannot pronounce. Users of FRS and GMRS radios, therefore, need to avail themselves of the trainings made available to amateur radio operators whenever possible. Know what you want to say before transmitting. Because radio exchanges need to be very brief, think about the sequence of the exchange. Remember the proper sequence of calling another station, “hey you, it’s me,” e.g. “Net Control, this is Rover 1.” Rehearse your question or statement in your head before you begin. Writing it down before you key up is a good practice the first few times on the air. When you are ready to transmit, remember Press, Pause, Speak, Pause, Release. New operators get excited and press the Push-To-Talk button *as* they are starting their transmission, which often results in the loss of the first, critical words of their message. Hold the button down and count to three before speaking. For the same reasons, remember to hold the button down for a few seconds after you finish your message. In the field, you’ll need to constantly monitor radio traffic while keeping your hands free to perform NET tactical operations. You can do this using an acoustical earpiece and what looks like a lapel microphone with a push-to-talk button. You’ll find that, in addition to being much more convenient, this kind of earpiece can help in very noisy environments. Know how to lock your radio. During tactical deployments, you will constantly be bending over and performing other movements that can cause buttons on your radio to be pressed, which will disturb the radio settings. Virtually all handheld radios have a means of locking their buttons so that only the volume control and push-to-talk button will work. Another reason to know how to lock and unlock your radio is, it may become inadvertently locked. Know the symbol on the screen that indicates this status and how to unlock your radio. Whenever you turn on your radio, momentarily turn off the squelch. On Motorola and Midland radios, this is done using the Monitor (or “Moni”) button. This will allow you to adjust the volume and squelch appropriately. When squelch is turned on, the radio is normally silent. A very common mistake is to leave the volume set too low to hear other stations. Having the squelch set too strong can also suppress weak signals. If you’re in a situation where you know that other radio operators are relatively far from your location or in poor radio propagation conditions, consider turning off the squelch entirely. You’ll need to turn down the volume to make the constant hush of noise bearable, but you will be able to hear the weaker stations. Avoid the use of “privacy tones.” These are also referred to as CTCSS squelch and PL tones. Privacy tones are marketed as a means to restrict which stations you can hear to only those that you want to hear. The problem is that if other stations are transmitting, their transmission will interfere with your reception of other signals and with other stations hearing your transmission. To avoid this, it is imperative that you be able to hear when other stations are using the channel. A common misconception about privacy tones is that they afford privacy. In fact, any radio that has the privacy tone feature turned off can hear both sides of the conversation. Before any deployment, the AROs or Team Leader should instruct all radio operators as to which channels will be used and what kind of traffic is appropriate. They should then have all of the radio operators check their radios to verify that the radios are in fact on the right channels, their batteries are fresh, and the radios are functioning properly. Finally, make sure that your NET has a clear set of whistle signals and that every member of the team has a whistle and knows how to use it. Very common whistle signals are: one blast means attention or warning, two blasts mean drop what you’re doing and come here, and three blasts mean Help! Even when batteries are fresh and operators are using their radios properly, radios can become useless in a number of different ways, such as failing to penetrate metal walls. For close range tactical communication, whistles can be quite effective. If too much time has passed since you have heard any communications over your radio, or if others appear unable to hear you, there are several things to check. As mentioned in the previous section, make sure that your privacy tone is turned off and your channel is correct. If your radio is not locked, it’s very easy for these to get changed without you noticing it. Double check your volume by turning the squelch off momentarily, as described above. Check your batteries. Some radios are intolerant of battery voltage excursions and will produce very poor transmit power while providing good reception. If others are not hearing you, and you think that they should be able to, this may be the culprit. Hold the radio with the antenna perfectly vertical. Radio waves are polarized and even a slight deviation from vertical can reduce your effective signal. Move around a little bit and try again. It may sound silly, but due to reflections off of buildings and other surfaces, radio waves can interfere with themselves constructively and destructively. Even moving a foot or two can move you to a location where reflections reinforce rather than cancel a signal. Make sure that you are not in a radio propagation “hole.” Get up to the highest level that you can. Look for a building or hill that will permit you to climb up to a higher elevation. FRS and GMRS radios have near “line of sight” propagation. You’re trying to get up above the obstacles and obstructions to your radios signal path.